Looking for something special for your someone special? Check out the saddle pads. Super tight weave pads, at a marvelous price. We have a great selection right now for all your boys and girls. Priced at $295.00 for an oversize pad that is 35:41. These pads are very well made, and our customers rave about them. We have some really great consignments in all price points. Check out all the categories of consigned jackets, vests, and shirts. There are some super buys for all price ranges. Welcome to Our New Website! We are excited to have a new website by Double S Designs. We will be busy adding new items during the World Show. Also watch our consignment section, we took in over 50 items at the Congress and they will be online soon. We are excited about the new site as it will offer more ways to sort and find your perfect outfit. The site will get better as we go forward and work out any problems. If you have suggestions or problems, let us know. Spring is here. Photo's of all the new foals are filling my facebook. Did you get a new horse this year? It is time to update, and freshen your show wardrobe. We have many new consignments from my winter show run. The price range is huge, so we should have something just right for you. Penny and her team have been turning out beautiful new garments. Is it time for a vest set? Yes, we have those. Our vest sets come in uber decorated, medium decorations, or maybe just a little light weight piece. We have been doing vests in super bright two way stretch silk. The silk is marvelous rich colors, and pairs perfectly with our debutante shirts. The shirts are completely washable. They are super easy to wear, and breathe. Futurity season is just around the corner and we have some over the top pieces too. Just added this week is a marvelous red, black, and white fringed vest set. Check out the Showtime Show Clothing, Inc. facebook page. You never know what is going to pop up. Super sales, and the coolest new of new. Give us a text, message, or pick up the phone. We love to hear from you our Showtime fans. 405:473:2178. 2016 And Showtime Is Off And Running! 2016 has started out with a bang with the mobile unit already attending three shows in the new year. The trailer is loaded with brand new one of kind Showtime Clothing as well as the best selection of consignments we have ever had. We try to give the best exposure to our consignors by attending more shows than any other consignment store. We accept both new and used show clothing. Once it is put online, then it is put in the trailer. And the trailer doesn't just sit in the driveway! Plus,the website gets hits from all over the World. We try to price the consignments with fair prices that are based on our experience of selling since 1993. We know the market. Customers know that we represent the garments truthfully and try to point out any flaws. We clean and repair the items as needed. We lower the prices if needed to make up for flaws. Its time to go through your closets and send us the things you no longer wear. We don't like to take dated and inexpensive garments. We are looking for stylish, unique pieces that are in good repair. We also take items from designers. We are happy to sell all brands of show clothing. 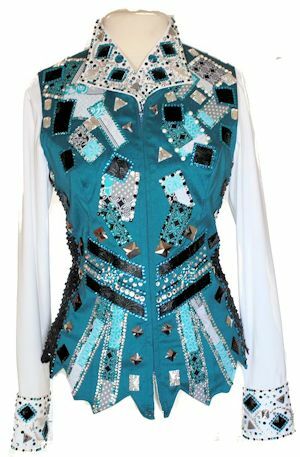 If you are shopping for show clothing and need things altered. We can help with that too. We have expert seamstresses who can improve the fit. If you need more crystals added, we can do that too. Showtime is a full service business. Our job is to help our customers with all their show clothing needs. We have a ten day return policy on everything. Unlike some "businesses" that want to take your money, then kick you to the curb if you need help after the purchase. Merry Christmas To Everyone! Thank You For a Great Year! We will be at the Copper Country Paint Show starting Dec 29th at West World in Scottsdale. We will be set up at West World until January 17th. Come by and see us! Gaga, the Shih tzu, greating customers. They all like to wear bows in their hair. Showtime is in Oklahoma City at a really special event. The world championship quarter horse show is underway and runs through Nov. 21. World champions will be crowned in all events. This is the culmination of one whole year of hard work. Fantastic facilities, a beautiful trade show and sunny skies await exhibitors this week in Okc. A state of the art equine show facility keeps the horses and exhibitors happy. Everyone dreams of riding into the Norick coliseum and coming out with the golden globe trophy. AQHA's most prestigious event is represented by 43 states and several foreign countries. Showtime is in our normal fantastic location in the cox building right below the 1800 sign. Stop in and see Kay and Kristi. We are open 9 a.m. to 7 p.m. daily. Gaga is here to greet you as well!! This event is always one of our favorites as the level of excitement and tension is high. Big prizes equal big fun. We look forward to seeing old friends and making new. Whoo Hoo the Congress is here. We are set up and selling. Come early and shop quick! We have new and used fabulous merchandise for your shopping pleasure. It is a mecca of merchandise. Katie Grossnickle is our host with Putting on the Glitz. Fantastic casual wear. We are once again at the Congress with Katie Grossnickle and Putting on the Glitz. You can buy fabulous show clothing, fancy and cool jeans for you and your daughter all at the same stop. The congress can be tricky with the temperatures, let us help you layer up and look your best. A scarf, a crochet vest, all over a tank. Do you need a gift for the fabulous barn or house sitter? We have you covered. Our space is large and most comfortable. Bring your husband and family. Comfy chairs,and Yes!! We have heat. Friendly staff, with Kristi, Teri, Kay, Katie and of course Penny the fabulous designer. Come see us. We have something for everyone. Let's make 2015 Congress our best. We look forward to seeing each and every one of you. Good luck to all.